When I saw the pick for this week's TWD I was actually really excited! Amanda of Like Sprinkles on a Cupcake picked Dorie's Cherry Rhubarb Cobbler. 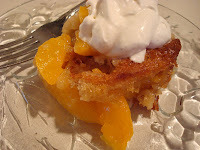 Reason #1 for excitement: I love, love, LOVE cobbler. Reason #2 for excitement: I have become very fond of the pink celery, other wise know as Rhubarb. Reason #3 for excitement: The recipe seems soo easy! Altercation reason #1: I live in Albuquerque, NM and could not find Rhubarb anywhere! I used to be able to find it frozen, but that still wasn't an option. Altercation reason #2: I actually like an entire crust on cobblers, not biscuit sized droppings. Last week the TWD Gang made Chocolate Pudding. I unfortunately couldn't participate in it, because I thought I didn't have the right equipment. But, thanks to those who left comments on my blog saying I could use a whisk I was ready to give that Chocolate Pudding a whirl! I decided to use Dark Chocolate Cocoa Powder, just because I'm a dark chocolate freak. 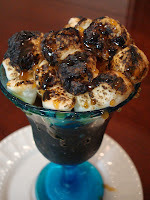 I also flamed up some mini marshmallows and added a caramel drizzle to the top! I felt like I had just made some fancy high-end dessert, and the pudding just melted in my mouth. Thank you Bloggers for convincing me to use my whisk, never again will I have store bought pudding!! wow! 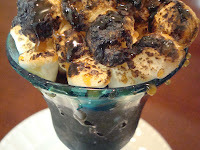 that pudding with marshmallows?? WHOA! And the cobbler looks delish, too! even without pink celery! Hehe - flaming mini marshmallows probably made that pudding! 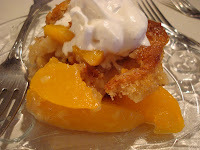 And peach cobbler is always a winner! YAY! I'm so glad you went back and made the pudding. It really is easy with the whisk too! Your cobbler/pie sounds delish too! Your peach cobbler *screams* summer. 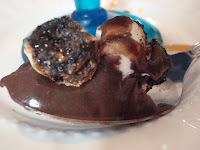 And I love the chocolate pudding done smore-style. Great job! Wow, both look fantastic! And I love those marshmallows on top. One step away from s'more pudding. I definitely have to try that! Now peaches and cherries I probably would have liked alot, good choice. Both your desserts look really tasty and I love marshmallows a ton! Great job on your desserts and I look forward to your post next week. i love peach cobbler! AND pudding. WOW. send some over please. btw just tagged you on my blog, check it out..!